Cloud infrastructure webcasts and videos on big data, Hadoop deployment, cloud for dev ops, digital media firms, large enterprises on data migration, hybrid cloud, cloud gaming, cloud for Mcommerce, Softlayer differentiator's and platform Vs AWS. Introduction to open stack deployment on Softlayer cloud, Core OS, Docker, data base services providers, security and compliance in the cloud. We will aim to run webinars that educate people on cloud computing Softlayer style! New technologies, our console, API's, intensive workloads needed bare metal servers Vs virtual machines, data centre technology, network and storage requirements. Keep watching this space to know everything about cloud computing with the 3 bars for life team! The clock is ticking and it’s time to act as Europe’s most demanding and far reaching Data Security regulation to date has been published. 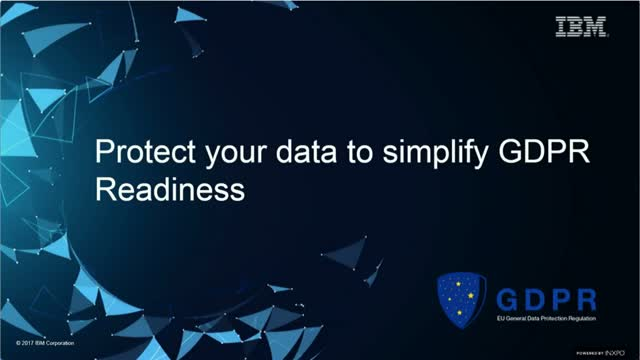 This webinar from IBM Cloud will examine the key requirements of GDPR, and look at how we can IBM's Cloud and Data security capabilities to simplify your GDPR Readiness journey. Practical application of data protection by design and by default in the Cloud - Data security, encryption capabilities, data breach notification, Multi Cloud SaaS offerings, IBM Cloud services and our Technical and Operational Measures. What does signing of 24 IBM Cloud infrastructure and PaaS services means in terms of data protection adherence under GDPR. When it comes to expanding your infrastructure capacity, cloud has a considerable reputation for being quick, easy and cost effective. In reality, IT professionals know that the implications around expansion into the cloud are wide, complex and often unknown. In over 100 cloud engagements, John Easton, Cloud Advisor and IBM Distinguished Engineer, has seen that success depends on understanding the business objectives, planning against those objectives - and using the right technology to deliver. Join John in conversation with Richard Appleby, Cloud Advisor as they discuss the steps successful organisations take when they need to expand quickly and easily into the cloud. Cloud security remains one of the top barriers to the adoption of cloud computing (Gartner top 3) and drives a need for new and broader security measures that go beyond traditional enterprise IT security tools and practices. Practical and technical advice can be applied immediately to help secure your organization's IT environment using SoftLayer's security-rich environment for deploying and running customer workloads. A full overview of the chip-level Intel®TXT security available first in the cloud at SoftLayer. Lastly learn more about IBM Cloud Data Encryption Services™ about Data protection, resiliency, security and storage. Many applications that are solving the world’s most challenging problems are running complex workloads that need high performance computing (HPC). Learn how these applications can actually work smarter and faster when they’re run in the cloud. This webinar is designed for CTOs, IT architects, information systems directors, content directors, programmers, researchers, and analysts who need to process large volumes of data. As workloads in media and entertainment—such as film rendering, game development, postproduction, visual effects, and animation—continue to grow in size and geographic location, there is a need for a scalable, global cloud computing environments to manage, collaborate on, and store media data. Brought to you by SoftLayer IBM Cloud, this webinar is designed for CTOs, information systems directors, systems engineers and administrators. You’ll learn about the advantages of moving media and entertainment workloads to the cloud and the initial steps and technical insights of creating render-ready, hybrid cloud infrastructure. Security is the number 1 inhibitor for most organizations looking to move to the cloud. Privileged user access, data location, data residency, boundary control, regulatory compliance, data segregation, IT support are some of the key security concerns. SoftLayer is the first cloud company to offer Intel® Trusted Execution Technology (Intel®TXT) as an additional method to secure customer’s infrastructure, down to the chip level. Organizations can simply take advantage of all that cloud has to offer for a growing set of workloads and data sets and feel even more safe that their data is secure and meeting their security and compliance needs. Do you trust your Cloud? Hybrid clouds are rapidly emerging as the ideal model for data-driven applications. The allure of better performance and agility at a lower total cost is compelling to business and technical managers alike. But how do you stay in control of your data? Through this webcast, you'll see how IBM clients and Business Partners are taking advantage of hybrid clouds, and how they're resolving the important issues of data management, data protection, and data security. Providing a seamless user experience from browsing to purchase requires consistent uptime and performance, and seasonal traffic spikes require elastic scalability. In this webinar, we'll explore these and other big data challenges faced by e-commerce businesses and how the cloud can provide a winning solution. We’ll review mobile shops login data analysis, dynamic content, affiliate programs, infrastructure reference architecture, mobile plate- form integration with social media, and network integration and built-in instant messaging uses cases. For any developer, choosing the right compute infrastructure and back-end database is a critically important decision. In this webinar, we'll explore specific challenges that mobile app and game developers face and how the cloud can provide a winning solution. We’ll also explore cloud solutions for big data challenges for MMOG, built-in analytics, online and offline MOG online modes, infrastructure reference architecture, and social network and cross-platform game use cases.